RED HARDrock Aggregates, LLC is currently evaluating quarry sites in Kentucky, North and South Carolina for development. 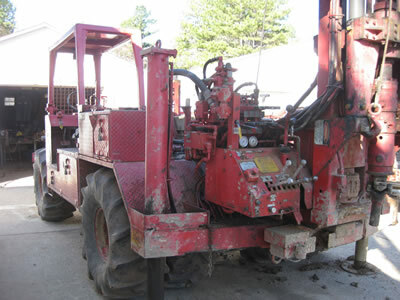 Our Principals have a long history of quarry development and operations. The chemical properties of crushed stone are important in determining its suitability for use in cement, concrete, and road base. The aggregate most ideally should be inert and not change chemically during use. Some rocks contain minerals that are chemically reactive in Portland cement, bituminous concrete or asphalt. In cement, alkali-silica reactivity can occur when silica reacts with alkali in the cement to form a gel around aggregate particles. The gel expands, causing spalling of the concrete. This generally occurs only where the rock contains silica in the form of natural glass, chalcedony, opal, chert, finely divided quartz, and strained quartz. Sulfides such as pyrite, if present in the rock, can react with oxygen and water to form iron hydroxides and sulphates. This will produce discoloration and weakening of the cement. Rocks with high silica contents have negative surface electrical charges and, as a result, attract moisture. Moisture along the surface of the rock grain breaks down the adhesion between the grain and bituminous material in asphalt, creating a condition called stripping. For this reason, some quartzite’s, gneisses, granites, and schist’s with very high quartz contents may induce stripping in asphalt. Surfactant chemicals are added to reduce this effect. 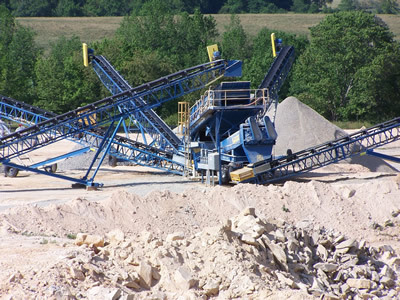 Physical properties critical for performance of crushed stone include strength or durability, porosity and pore size, and volume integrity (maintenance of constant volume) while being subjected to freezing and thawing conditions. The natural habit of breaking into cubic or relatively cubic particles on crushing is also important. Aggregate quality of igneous rocks like granite and diorite is determined by the strength of interlocking bonds between quartz, amphiboles, and biotite. Fine to medium grained, mafic igneous rocks such as diabase, gabbro, and diorite are highly resistant to abrasion due to the strength of interlocking grains. More felsic igneous rocks are less resistant to abrasion, but generally have a strength that is quite suitable for use as aggregates. The typical processing plant production will be designed at a production rate of 500-tons/hr (tph) or 300,000 Tons Per Year (TPY) from initial start up to about 1,1,00,00 TYP at full capacity projected for year 5. Our plants are designed to produce rail road ballast, roadway materials, and cement aggregates. Currently no Projects to display.